This is that time of year when we seem to go around the clock but we sure packed a lot of living into this week! One of those seemingly endless meetings that I alluded to last week started off this week. I went down to Robeson county to participate in a panel discussion to help kick-off Small Farms week. A lot of activities surround NC A&T State Univ. Small Farms week including the naming of the Small Farmer of the Year, this year it is our very own Stanley Hughes who sells with us at the Saturday market! Betsy and I were chosen in 1995, a long and dusty time ago. Got home in time to help Betsy cover a wide variety of crops with floating row cover in anticipation of the cold. 18 degrees here on Tuesday morning, everything looks fine tho’. 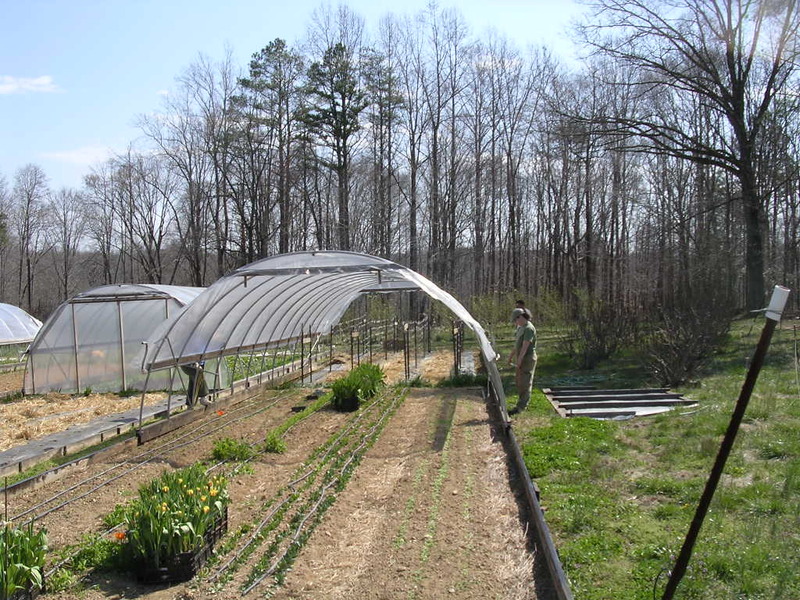 There are a few critical weeks in every season (tomato and pepper planting weeks being two) this week happened to be one of those as it is the week that we “slide” our sliding tunnels/greenhouses. For those of you who have been to the farm before you have seen our six 16’X48′ tunnels on rails that we move to cover sensitive crops. I takes the better part of two days to complete that move which includes taking the end walls off, unbolting endless bolts, the actual slide and then putting it all back together again. We got smart this year and actually split it into two days (Tuesday and Thursday).